A few weeks ago I was sitting at the table in my sunroom reading the daily paper. 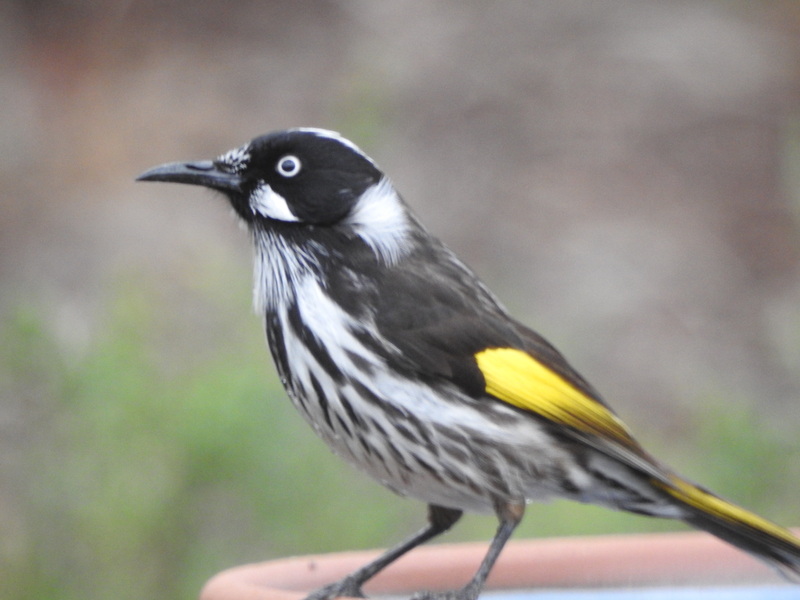 I was suddenly distracted by some birds at my bird baths just outside the window. This is a favourite place of mine to sit because I have an uninterrupted view of several bird baths strategically placed in my garden. During the warmer weather, there is often a steady stream of birds coming to drink and bathe in the water. Sometimes, the bird baths need daily replenishment. Many of the photos featured on this site have been taken of birds at the birdbath. Once I saw that the bird was a Crested Pigeon sitting quietly on a branch near the top bird bath, I went to get my camera. It stayed there on the birdbath for a few moments, and then it moved to a nearby branch. It was then that its wing feathers caught the rays of the sun and showed up the brilliant iridescent colours (see the photos above and below). 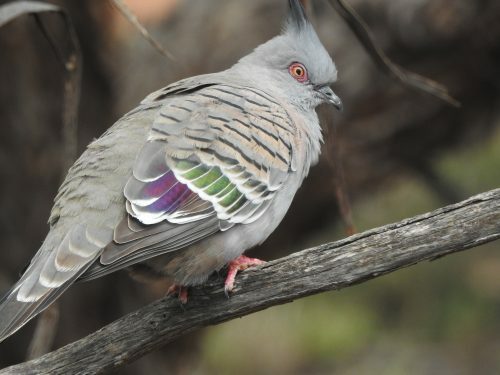 On most occasions, this species appears to be a dull grey with only a few white and black markings. In certain angles of the sunlight, the colours show up beautifully. 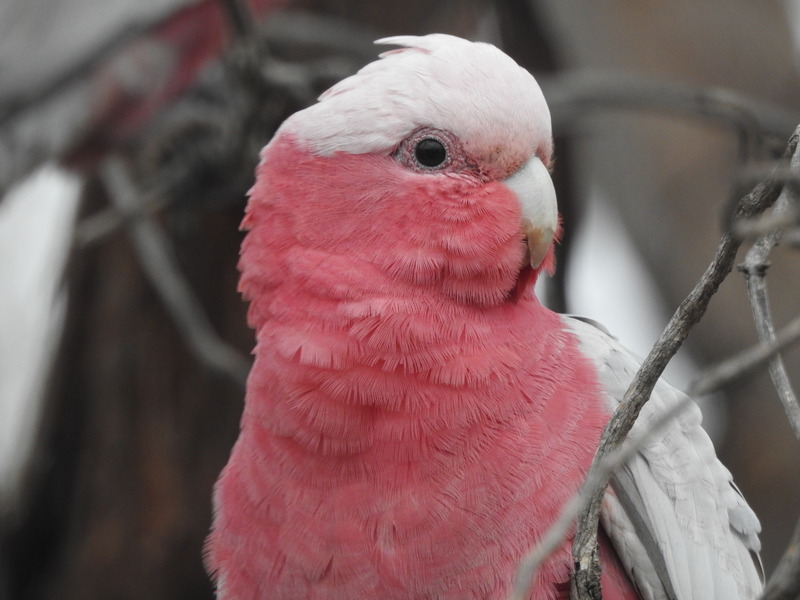 When I zoomed in to take close-up photos, the beauty shows up even more – as seen in today’s selection of photos. 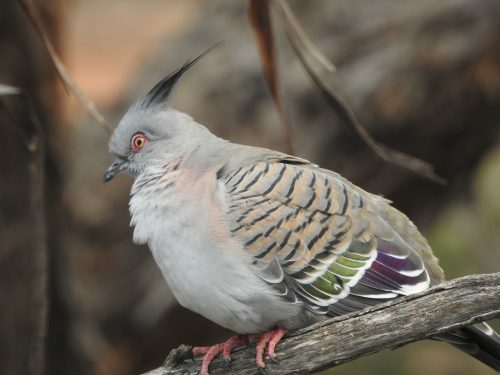 I have often written about the Crested Pigeon on this site, and I have shared many photos of them over the years. To read these articles and see the photos use the search button at the top of the page or click here. The individual in today’s photos stayed around for about five minutes, enabling me to take plenty of shots in various poses. Bird photography can sometimes be a little frustrating because the subjects have a tendency to up and fly off – just when the camera has focussed on the bird. When they do pose nicely it is a wonderful bonus. 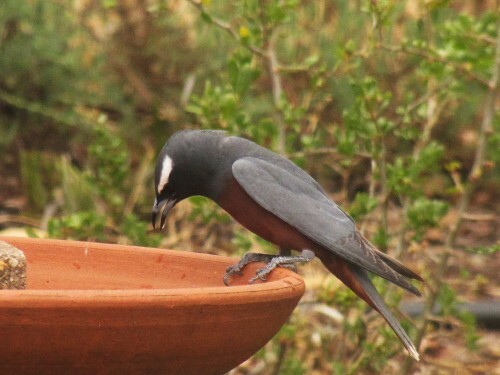 During the warmer months of the year, there is a constant stream of birds coming to my birdbaths for a drink. On hot days many of them will also come for a dip in the water. What always amuses me, however, is the number of birds which also come for a dip in the water on freezing cold days. Some of the birds which regularly visit my birdbaths include 8 different species of honeyeaters, 3 kinds of parrots, Australian Magpies, Little Ravens, Grey Currawongs, White-browed Babblers, Superb Fairy-wrens, House Sparrows, Diamond Finches, Common Starlings, Grey Shrike-thrush, as well as at least 3 kinds of pigeons and doves and many other species. Over the years I have written articles and shown photos of most of these species. To find those articles just go to the search box above right or the Categories list on the right-hand side-bar. Or you could check out the archives section. It is now winter here in Murray Bridge, South Australia, where I live. Over recent days we have had some very frosty mornings and cold nights. The water in the birdbaths is very cold and may even freeze on a night like tonight with the temperature due to go down to minus 1 degrees Celsius (30 degrees F). The birds will still be happy to have a drink during the day and even a short splash in the very cold water. I don’t think that I will be joining them in a hurry. They can enjoy it all to themselves. 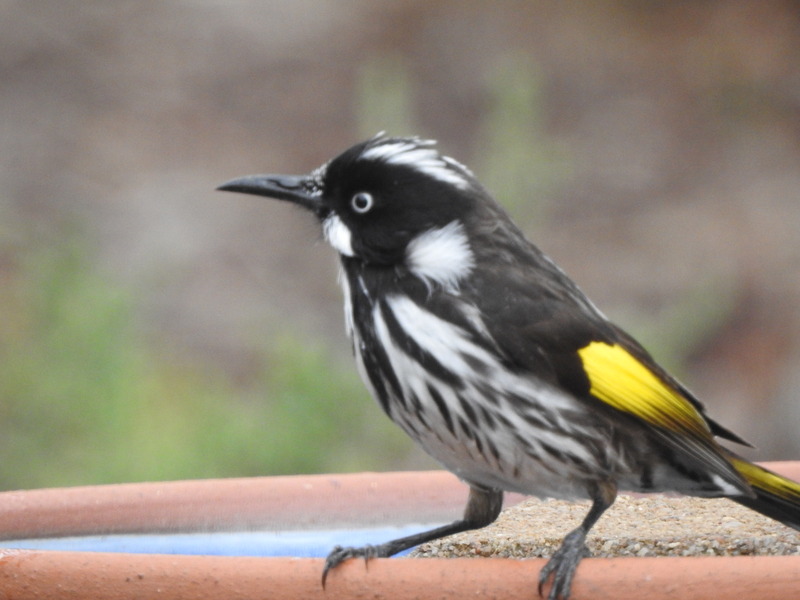 Recently I took a series of photos (above and below) of a solitary New Holland Honeyeater enjoying the water. The individual was quite unhurried seeing it had the water all to itself. This is unusual because normally there would be anything up to a dozen birds or more, all splashing away happily and creating quite a noisy party with all of their excited calls. 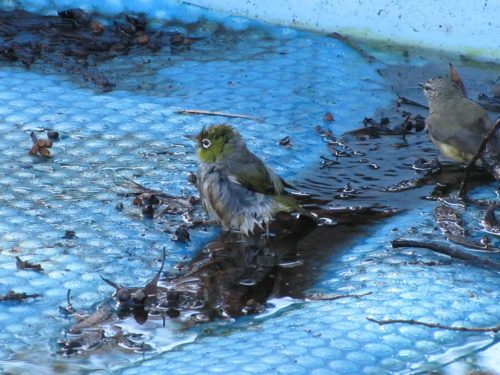 In my last article here I posted some photos of Yellow-rumped Thornbills bathing in the small pools of water which gather after rain on our swimming pool solar blanket. 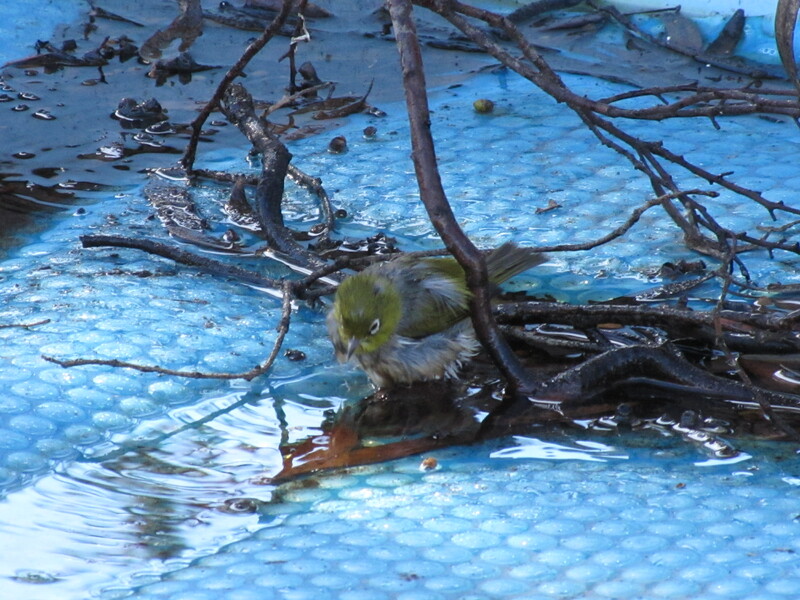 On the same day, a small number of Silvereyes also came for a drink and to bathe. I have shown these in today’s post. Our swimming pool is in our backyard, a short distance from our back veranda. On nice sunny days when it is not too hot in the middle of summer, or not too cold in the middle of winter, we enjoy sitting on the veranda to have our lunch. Sometimes we take a mid-morning break there for a cup of tea or coffee. We have also taken an afternoon break when gardening. 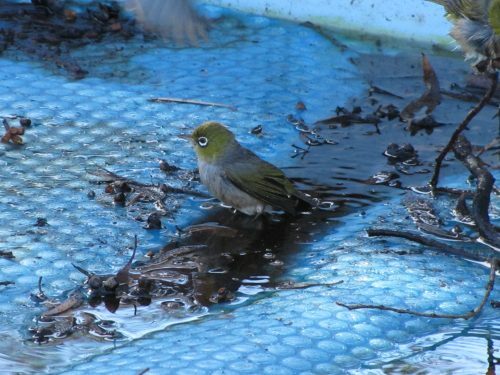 On all of these occasions, we enjoy the constant parade of birds in our garden, perched on the fence or in the trees nearby, and on the pool cover like the Silvereyes shown today. I often have my binoculars and camera at the ready while we sit there. 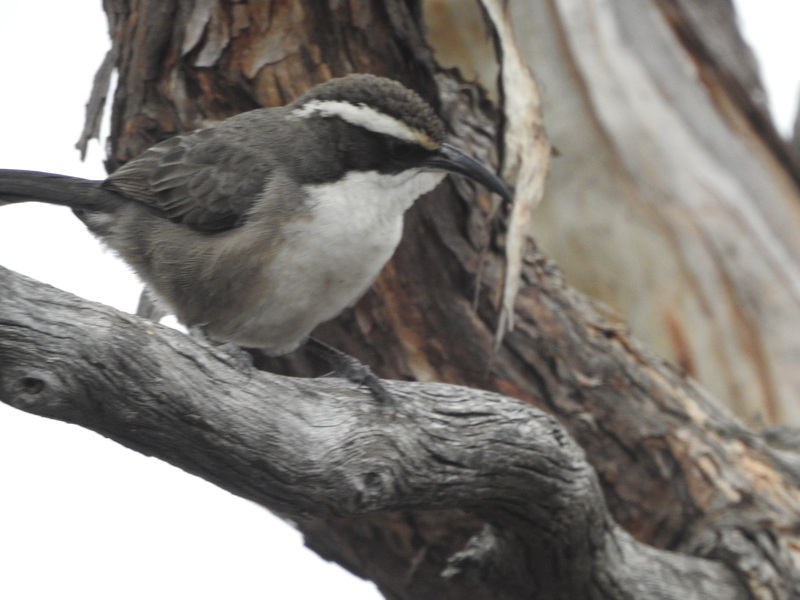 On this occasion, I managed to get many photos of the Silvereyes and the Yellow-rumped Thornbills. A Grey Fantail was also fluttering around, but you will have to return in a few days’ time to see those photos in my next post. Our resident Australian White-backed Magpies also come to drink, and the bossy Red Wattlebirds will chase the smaller birds off. 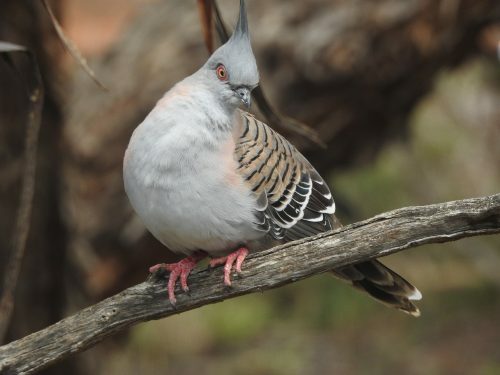 White-plumed Honeyeaters flit in and out nervously, while the Peaceful Doves take their time, gradually getting closer and closer until they gather the courage to stoop and drink. 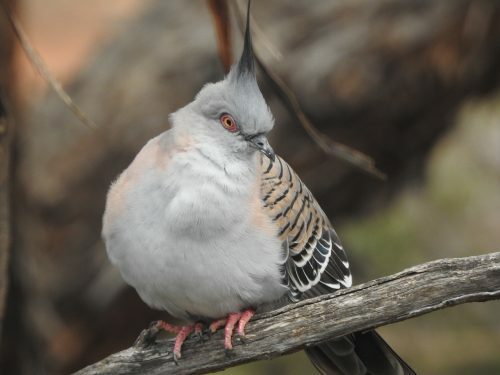 The Crested Pigeons also come for a drink, though they are usually more interested in mating displays than drinking. The Welcome Swallows occasionally swoop low over the pool but more often they are seen much higher in the air. 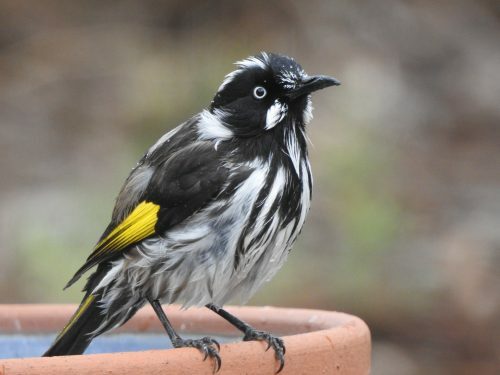 The many House Sparrows and Common Starlings come frequently to drink and bathe, but the resident Mallee Ringnecks rarely do so; they prefer to feed in the nearby trees. The Willie Wagtails, however, are frequent visitors to this part of the garden. As you can see, it is never boring in our garden if you are a birder like myself. PS: Over the years, I have written articles about all of the birds mentioned in this article. To see photos of them, and to read more about each of them, use the search facility in the top right-hand corner of any page. It has been a year of great weather contrasts this year in South Australia, and in other parts of the country too. At various times it has been freezing cold, fiery hot, bucketing with rain, wild storms and everything in between. We have also had the occasional beautiful day as well. Our state has had terrible bushfires, devastating floods, power blackouts from storms, crop damage due to large hail and silently creeping frosts. Now we are about to feel the full force of summer weather. Christmas Day tomorrow promises temperatures in the low 40s (40C = 104F). In fact. our capital city Adelaide is forecast to be the hottest capital city in the world on Christmas Day. Still, at this time of the year, we expect some days in the 40s and many days in the 30s. The heat can adversely affect our birdlife here in Australia. One of the best things people can do in these hot conditions is to put out clean water for the birds. I have several birdbaths dedicated to the birds in our garden. 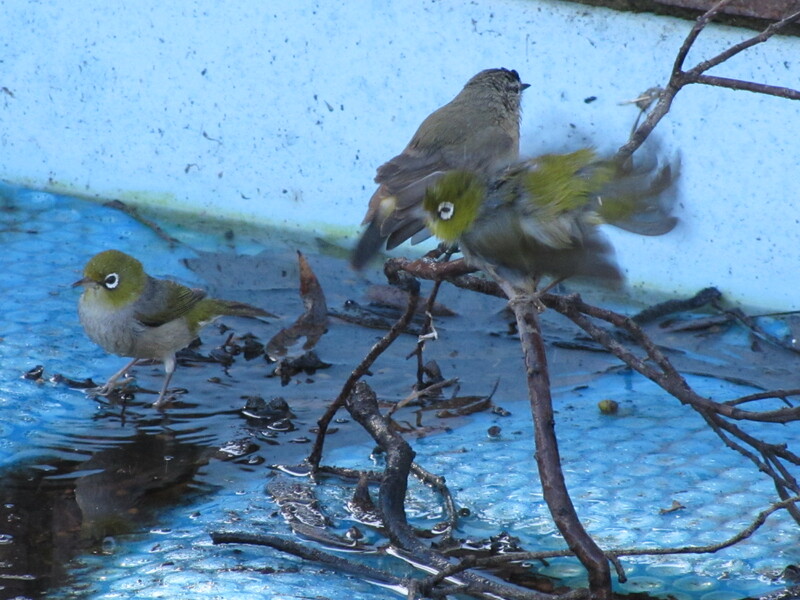 A constant stream of birds come to have a bath or a drink on hot days. Even on mild days, the bowls are very popular. Place the bird bath in a shady location near to a tree or bush. This can help protect the smaller species from birds of prey; it gives them a place to escape. It can be on the ground but is better if it is elevated a little. This will give the birds a clear view of any approaching cats. 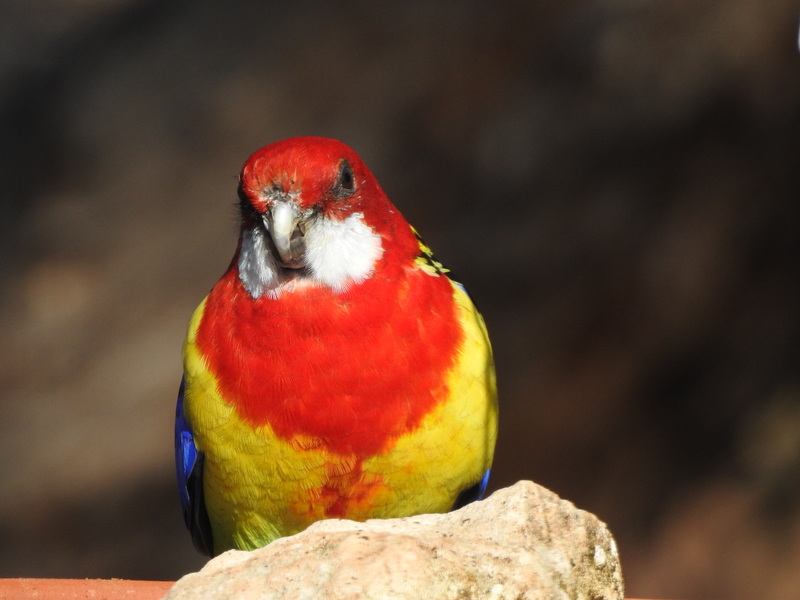 Try to remember to clean the bird bath regularly, and during our hot weather this summer, top it up every day. I have found over many years that having a bird bath near a window makes it easy to get good photographs of the birds while they are drinking or bathing. My wife and I find it very relaxing sitting in a cool room on a hot day, watching the parade of birds coming to drink. 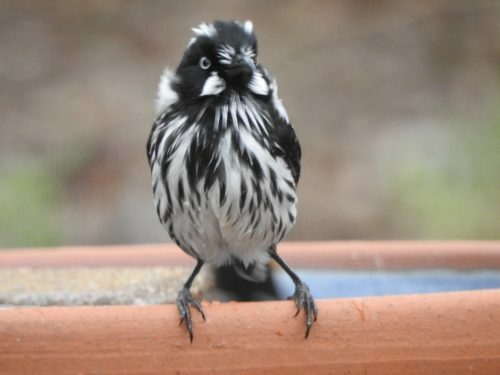 You are currently browsing the archives for the Bird baths category.